It is widely recognized that travel and tourism can have a high environmental impact and make a major contribution to climate change. It is therefore vital that ways to reduce these impacts are developed and implemented. 'Slow travel' provides such a concept, drawing on ideas from the 'slow food' movement with a concern for locality, ecology and quality of life. The aim of this book is to define slow travel and to discuss how some underlining values are likely to pervade new forms of sustainable development. It also aims to provide insights into the travel experience; these are explored in several chapters which bring new knowledge about sustainable transport tourism from across the world. 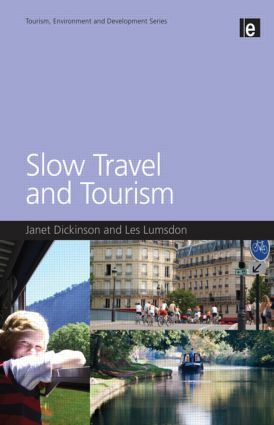 In order to do this the book explores the concept of slow travel and sets out its core ingredients, comparing it with related frameworks such as low-carbon tourism and sustainable tourism development. The authors explain slow travel as holiday travel where air and car transport is rejected in favour of more environmentally benign forms of overland transport, which generally take much longer and become incorporated as part of the holiday experience. The book critically examines the key trends in tourism transport and recent climate change debates, setting out the main issues facing tourism planners. It reviews the potential for new consumption patterns, as well as current business models that facilitate hyper-mobility. This provides a cutting edge critique of the 'upstream' drivers to unsustainable tourism. Finally, the authors illustrate their approach through a series of case studies from around the world, featuring travel by train, bus, cycling and walking. Examples are drawn from Europe, Asia, Australia and the Americas. Cases include the Eurostar train (as an alternative to air travel), walking in the Appalachian Trail (US), the Euro-Velo network of long-distance cycling routes, canoe tours on the Gudena River in Denmark, sea kayaking in British Columbia (Canada) and the Oz Bus Europe to Australia. Janet Dickinson is a Senior Lecturer in the School of Services Management, Bournemouth University, UK. Her research interests include the social construction of sustainable tourism and transport. Les Lumsdon is Professor of Tourism in the School of Sport, Tourism and the Outdoors, University of Central Lancashire, UK. He is director of the Institute of Transport and Tourism and co-editor of Tourism and Hospitality Planning & Development.